Friday's Tmac's Teachable Moment concerns filling in for a crew mate to avoid an uncovered play. Sometimes when you take a baseball field at any level, a partner makes a positioning mistake. Now here's the question: Are you the kind of person who can recognize this mistake and pick him up or do you let him burn? Today's teachable moment is about crewmanship and how to pick up your brothers on the field. We have an unattended play at third base. Take a look at this play from Wednesday's Cleveland-Colorado game at Coors Field. Watch the first 11 seconds of the attached video. Notice anything unusual? You may notice there is no umpire at third base to make this call. While I don't expect most of you to know the intricacies of 4-man mechanics, the play begins with one out and a runner at 2nd base. The batter hits a fly ball to left field, and a tag-up situation will ensue. The 3B Umpire is Greg Gibson, 2B has Sam Holbrook, 1B is DJ Reyburn, and Jim Wolf has the plate. 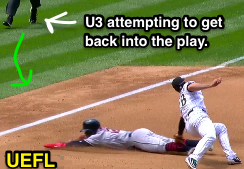 In this situation when U3 (Greg Gibson) goes out, U2 (Holbrook) has responsibility for the play at 3rd, while the out umpire (U3) is to stay in the outfield for the remainder of the play; the plate umpire (Wolf) will remain at the dish for a potential overthrow/scoring play. Wait a minute; where did heck did Reyburn come from at :14 seconds of the video? Was he in the stands in uniform waiting for a play just like this? Did he drop out of the sky? Reyburn recognizes the lack of coverage. Or did he recognize a potential disaster at third base and pick up his crew mate? In the modern era of expanded instant replay, the missed call doesn't matter, but it's the instincts to realize potential disaster is looming that separates the wheat from the chaff. You'll notice that, like Reyburn, Gibson also picked up the mistake on the video at :51 seconds and attempts to sprint back get a decent look at the tag into 3rd (the best look is at 1:17 when you see DJ sprinting across the infield). U3 Gibson also saw the vacancy at third base. There's another takeaway here. It's always good to keep your head on a swivel and know when a partner goes out. Picking up your partner can save you potential disasters. In four-man, someone goes out on nearly every play to the outfield, but there are advanced mechanics to keep an umpire ahead of the play, so it would have been permissible for the 1st base umpire to go out on this play for some CCs (this is a crew-dependent policy and deviates from the "standard" MLBUM mechanic). In summary, be a good teammate. Nobody wants to work with a guy who hangs others out to dry. Stay focused. If this play happens to you, there's no replay to save you. Also, if you make a mistake out on the field and someone picks you up, be grateful. Say thank you. And above all else, HAVE FUN out there!!!! Until Next time, Happy Umpiring!